Are you looking for a professional bartending kit? Maryland Bartending Academy can offer you a quality, money-back guaranteed set of all the bartending tools that the experts use. For over 30 years, Maryland Bartending Academy has been Maryland's premier bartending college, teaching students about mixology, flair and trick bartending, and how to get ahead as a professional bartender. 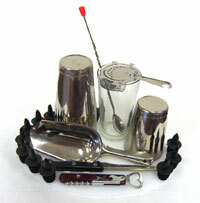 If you are interested in a high quality bartending kit, simply click here for ordering information. If you are thinking about an exciting career in the bartending industry, either click here or call 410-787-0020 today! If you are thinking of working your drink-making magic either as a professional bartender or as an amateur for your friends, either way you will need expert gear like our professional bartending kit. With our set of bartending supplies, you will be able to make everything from a standard highball to those crowd pleasing fancy shooters. You will look and feel just like a professional. Not to mention that you can practice your trick bartending (also known as flair) at home, so you can wow your friends with your cool bartender skills. What Does This Bartending Kit Include? 32oz. Lg. Stainless Steel "SHAKER TIN"
16oz. Sm. Stainless Steel "SHAKER TIN"
16oz. Heat Tempered "MIXING GLASS"
These items make up the core of what every well-stocked bar contains. This portable kit is regulation quality for both competitions and the professional bartending world. Want To Go From An Amateur to A Professional Bartender? It takes more than the best tool kit to be a professional. It takes some training and a lot of practice. If you think you are ready for a bartender school in Maryland, then look towards a free intro class at Maryland Bartending Academy. It is the best way to learn the recipes, techniques, and drink mixing mechanics of the experienced bartender. From casual neighborhood pubs to the higher end fancy bars, management only wants to hire certified, knowledgeable bar staff. Beyond mixing and preparing drinks, bartenders have to be able to juggle, at times, long lines of orders with good customer service. It takes experience and proper instruction to learn the real tips and tricks of the bartender trade. MBA can help you earn the best tips, making you an in-demand, highly skilled, bartending professional. To purchase your bartending kit, click here!